Mortenson Construction worked with Pennsylvania State University to bring their new intramural facility’s rock climbing wall to life. We spoke with Taylor Cupp, Project Solutions Technologist at Mortenson Construction, about why the firm decided to use virtual reality, how VR fit into their workflow, and more. Why did you decide to integrate virtual reality into this particular project? A key factor in deciding to integrate VR into this project was the ease of use and speed of deployment. It was a very economical way to help the customer understand their options as well as the scale of the space. Through the use of layering of strategic options, the customer was able to experience a basic form of interactivity in exploring design options that were out there. What was your workflow & VR hardware setup? With this project, we wanted to explore design alternatives that were a composite of design models, coordinated construction models, and a fabrication model of the primary design feature of the project (the climbing wall). To accomplish this, a Navisworks model was exported into Sketchup, where the model was then color coded for reviewing coordination of MEP elements in Prospect. We entered VR via Prospect with an HTC Vive, which allowed the client to move throughout the space. How did this meeting - with VR - differ from others without VR? This meeting differed from others in that the discussion was more directly focused on what the customer’s true objectives were. They were able to discuss spatial relationships, volume of the space, and scale of the key design feature (the climbing wall). They also explored functional relationships around systems in a whole new manner than they had before. In the end, I think we really landed on absolute confidence in several key project decisions, resulting in an extraordinary facility. What do you think the benefit to VR is? The use of IrisVR allowed our customer to quickly make a decision, explore alternate designs, and move on to the next steps. It was productive as the team realized several different issues in VR that were a lot harder to spot on-screen. Those issues were realized mostly as the result of the better understanding of scale that VR offers and ability to study issues with line of sight. One of the customers on-site even said, "Before it was just a virtual on screen model, I can physically feel what the space restrictions are." 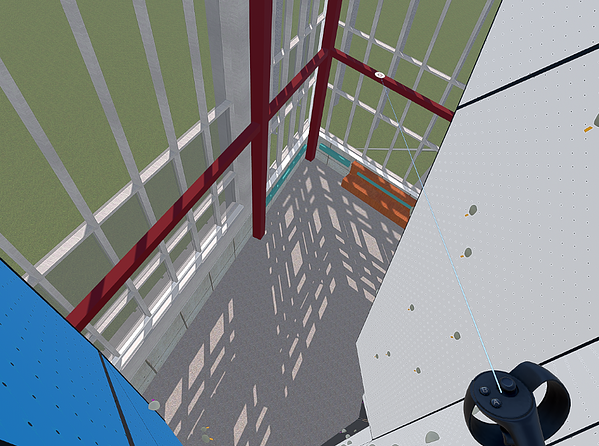 In the end, within one review, the client asked for a more in-depth analysis, re-reviewed their model with accurate lighting applied, and made a confident decision about their rock climbing wall. Additionally, the client had such a positive first experience going into VR with Prospect that they made further requests to incorporate it into their workflow and decision making processes. Want to give Prospect a try? Start a free trial today.